~Do I have to buy a fishing license? *No, The Golden Legacy has a charter boat license which covers all passengers for fishing. ~Do I need to bring fishing gear? *No, all fishing rods, dead bait, ice, and tackle are provided. *Live bait is not included in the price of your trip but maybe purchased by customer at bait barge/boat on your departure. Upon request the Captain will ride to the barge/bait boat during the beginning of your trip. 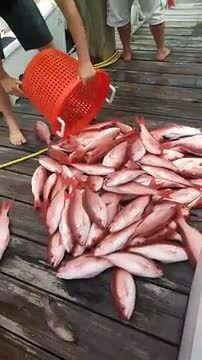 Live bait is usually only used during Red Snapper season. *Bring a well stocked cooler of your favorite snacks and drinks. *You may also want to bring a second cooler (leave at the dock) to put your catch in upon your return. *Please wear "Non-skid" shoes for your safety. *Gratuity for the crew. Our crew is experienced and work hard to make sure you have a fun memorable trip, and they make sure you and your party is happy, "tips are appreciated" Customary gratuity for the crew is 15%- 20%. * Other helpful items include but not limited to....Hats, Polarized sunglasses, sun screen, Towels, (a poncho if the weather call for rain) and your camera's. Watch the weather and dress appropriately for your trip. A light jacket for early morning departure and late evening returns is a good idea. ~Are there any additional cost/ fees? ° A $200.00 equipment replacement fee if rod and reel are lost over board payment will be due at the end of your trip. °A $200.00 clean up fee if anyone get sick inside cabin. Payment will be due at the end of your trip. If you would like additional photos they available through the photographer, prices range from$10-$20 each, depending on the size of the photo. ~ Is alcohol allowed on the boat? *Yes, we want our customers to relax have fun and enjoy themselves while fishing, however, you must bring your own alcohol, And we do ask that you drink responsibly and have a designated driver. ~ What happens to my fish at the end of the trip? * Usually we set the fish up on the dock for photos, after that you can have your fish loaded up in your cooler to take home or have them taken to our Marina's fish market for processing. Your fish must be picked up within 3 days of drop off. Also see our short video below. ~ Is there a age limit? * No, all are welcome. ~What kind of fish will we catch and how much are we allowed to keep? *This will depend on the season, the limit per-person, and the length of your trip. Trolling trips: King Mackerel, Spanish Mackerel, Wahoo,Cobia, Mahi Mahi, Bonita, etc. Red Snapper season will be OPEN for us June 1st- August 1st. Gag grouper will be open Austin 1st. We would recommend a minimum of a 8-10 hours for Grouper Trips. ~What kind of trips do you offer? Bottom trips range from 6, 8, 10, 12, 14, 16, 18 hours and can go up to 2 days adventurous fisherman. ~ How many people can we bring? *The Golden Legacy is a 6 pack vessel, which mean she can hold 6 passengers, plus the captain and crew member. If you happen to have over 6 passengers, we also work with another vessel at our marina, who we can do a "rod to rod challenge" We can split the group onto the two vessels and see who comes in with more fish or the biggest fish. With this you will be completely booking both boats and regular rates will apply for each individual vessel. This does not include crew gratuity. Call for details on availability. ~ What if someone in my party has a disability? * If someone in your party has a disability or may need special attention please let us know while booking your trip. We love the water and fishing and we would love to give everyone the opportunity to enjoy it themselves too, we will do our best to accommodate your needs. ~Do you require a deposit and What is your refund policy? *Full payment will be due prior to vessel's departure. *If there is a "no-show" full payment of trip will be charged. Due to lost of trip. *If Captain determines it is not safe to go out due to rough weather a rebooking or a full refund will be made if already paid in advance. *If vessel cannot depart due to unforeseen machanical issues a rebooking or a full refund will be made. *If you do not want to cancel a trip but would like to reschedule please contact us as soon as possible to check availabile times and dates. * If your party is running late the day of departure please contact us as soon as possible. ~How do you accept payments for trips? *We accept all major credit cards as well as cash, while booking a trip you will be asked​ for a valid credit or debit card number to hold the designated time and date, if paying with a credit/debit card just bring it with you to process before vessel's departure, if you would like to pay it with cash we will still need a vaild card number to hold on file to hold the time and date until full payment is made the day of departure,if you would rather pay a deposit in cash instead of putting a card on file we will set up an appointment time at the earliest convenience of both parties to meet at the Marina where the vessel is docked, to accept cash in person ( please do not send cash through the mail) If you pay with a card you will receive a receipt of your choosing, options are have it e-mailed or texted to you for your own records. Depending on what you would prefer. If paying cash you can have a written receipt upon request. ~What information do you need while booking a trip? * You will be asked for your, (name, email address, mailing address phone number, the amount of passengers in your party, and how many hours you would like your trip to be, and a valid card number to hold on file for your trip.) Your information is private and will only be use for purposes of a contact and for booking your trip. Card information on file will be destroyed upon full payment at the end of your trip. What happens to my fish? Here's a short video showing what happens to your fish at the end of your trip.